As you read the Bible, what you are viewing is the actual word of GOD which is absolute truth. This truth is the light that exposes the darkness of this world. You will see His will in each matter of your life, and for mankind's as a whole. You will read detailed factual information about exactly what events have transpired in the past, when they occurred, and what will be the future of humanity. You will see both holiness and ungodliness clearly demonstrated, and an end to the blur between what is right and wrong. 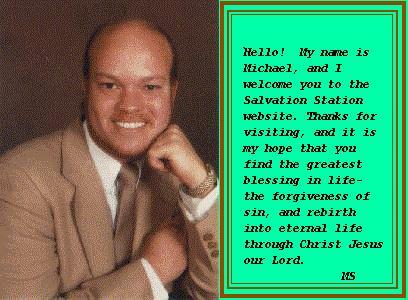 You are reading about the only way to be forgiven for your sins and enter into eternal life. There are sixty-six books which compose the King James English translation of the original Hebrew and Greek scriptures presented here at the Salvation Station. It is divided into two major sections, the Old and New Testaments. 1. How the Bible was composed? GOD has spoken by His prophets, through the ages. These were Holy men of GOD who were consecrated by Him for that purpose. They were filled with the His Holy Spirit, and lived and walked in fellowship with Him. These men recorded the inspired words given them by their creator. Finally, in these last days, GOD has spoken to us by a Son, Yeshua of Nazareth. In John's gospel, the first chapter, He is referred to as the "Word" who was both "with God", and who "was God". He is the Light of the world. His diciples, which later became Apostles also recorded their gospels as they also were inspired by the Holy Spirit of GOD. Today, we have these words for our benefit, as the sixty-six books of the Bible. "All scripture is given by inspiration of God, and is profitable for doctrine, for reproof, for correction, for instruction in righteous- ness:  That the man of God may be perfect, throughly furnished unto all good works." "Knowing this first, that no prophecy of the scripture is of any private interpretation. [:21] For the prophecy came not in old time by the will of man: but holy men of God spake as they were moved by the Holy Ghost." Throughout the early centuries of this millenium, the original Hebrew and Greek scriptures were translated into several different languages throughout the world. Between the 7th and the 14th centuries, some of the original scriptures were gradually translated into the english language. The first complete fully english translation was produced in 1382 by John Wycliffe, an Englishman, whose purpose was to get the holy scriptures out to to common man (as opposed to religious hierchy). William Tyndale followed in 1525, along with several other intermediate translations up to the 1600's. The King James translation of the holy scriptures was produced in the year 1611. In the year 1604, King James I of England commissioned a translation of the original greek and hebrew scriptures by a team of translators. It is one of the most powerful, Holy Ghost empowered, accurate translations into the english language ever completed. From it's establishment in the year 1611 it has also been known or referred to as the 'Authorized Version', presumably by the Church of England. The following is a writing by the team of dedicated translators upon the completion of their commission, to King James I who gave them that commission. It is by no means the inspired word of GOD or should be thought of as such, however, it does display their attitude to the great work to which they were called, their respect for the 'Original Sacred Tongues' indicating a great respect for the Hebrew language. Please bear in mind as they make their statement, that unlike today, during this era men had great respect for their heads of state. Here is their "Epistle Dedicatory". "The translators of the Bible wish Grace, Mercy, and Peace, through Jesus Christ our Lord." "Great and manifold were the blessings, most dread Sovereign, which Almighty God, the Father of all mercies, bestowed upon us the people of England, when first he sent Your Majesty's Royal Person to rule and reign over us. For whereas it was the expectation of many, who wished not well unto our Sion, that upon the setting of that bright Occidental Star, Queen Elizabeth of most happy memory, some thick and palpable clouds of darkness would so have overshadowed this Land, that men should have been in doubt, which we they were to walk; and that it should hardly be known, who was to direct the unsettled State. The appearance of Your Majesty, as of the Sun in it's strength, instantly dispelled those supposed and surmised mists, and gave unto all that were well affected exceeding cause of comfort; especially when we beheld the Government established in Your Highness, and Your hopeful Seed, by an undoubted Title, and this also accompanied with peace and tranquillity at home and abroad." "But among all our joys, there was no one that more filled our hearts, than the blessed continuance of the preaching of God's sacred Word among us; which is that inestimable treasure, which excelleth all the riches of the earth; because the fruit thereof extendeth itself, not only to the time spent in this transitory world, but directeth and disposeth men unto that eternal happiness which is above in heaven." "Then not to suffer this to fall to the ground, but rather to take it up, and to continue it in that state, wherein the famous Predecessor of Your Highness did leave it: nay, to go forward with the confidence and resolution of a Man in maintaining the truth of Christ, and propagating it far and near, is that which hath so bound and firmly knit the hearts of all Your Majesty's loyal and religious people unto You, that your very name is precious among them: their eye doth behold You with comfort, and they bless You in their hearts, as that sanctified Person, who, under God, is the immediate Author of their true happiness. And this their contentment doth not diminish or decay, but every day increaseth and taketh strength, when they observe, that the zeal of Your Majesty toward the house of God doth not slack or go backward, but is more and more kndled, manifesting itself abroad in the farthest parts of Christendom, by writing in defence of the Truth, (which hath given such a blow unto that man of sin, as will not be healed,) and every day at home, by religious and learned discourse, by frequenting the house of God, by hearing the Word preached, by cherishing the Teachers thereof, by caring for the Church, as a most tender and loving nursing Father." "There are infinite arguments of this right Christian and religious affection in Your Majesty; but none is more forcible to declare it to others than the vehement and perpetuated desire of accomplishing and publishing of this work, which now with all humility we present unto Your Majesty. For when Your Highness has once out of deep judgment apprehended how convenient it was, that out of the Original Sacred Tongues, together with comparing of the labours, both in our own, and other foreign Languages, of many worthy men who went before us, there should be one more exact Translation of the holy Scriptures into the English Tongue; Your Majesty did never desist to urge and to excite those to whom it was commended, that the work might be hastened, and that the business might be expedited in so decent a manner, as a matter of such importance might justly require." "And now at last, by the mercy of God, and the continuance of our labours, it being brought unto such a conclusion, as that we have great hopes that the Church of England shall reap good fruit therby; we hold it our duty to offer it to Your Majesty, not only as to our King and Soverign, but as to the principal Mover and Author of the work: humbly craving of Your most Sacred Majesty, that since things of this quality have ever been subject to the censures of illmeaning and discontented person, it may receive approbation and patronage from so learned and judicious a Prince as Your Highness is, whose allowance and acceptance of our labours shall more honour and encourage us, than all the calumniations and hard interpretations of other men shall dismay us. So that if, on the one side, we shall be traduced by Popish Persons at home or abroad, who therefore will malign us, because we are poor instruments to make God's holy Truth to be yet more and more known unto the people, whom they desire still to keep in ignorance and darkness; or if, on the other side, we shall be maligned by selfconceited Brethren, who run their own ways, and give liking unto nothing, but what is framed by themselves, and hammered on their anvil; we may rest secure, supported within by the truth and innocency of a good conscience, having walked the ways of simplicity and integrity, as before the Lord; and sustained without by the powerful protection of Your Majesty's grace and favour, which will ever give countencnace to honest and Christian endeavors against bitter censures and uncharitable imputations." "The Lord of heaven and earth bless Your Majesty with many and happy days, that, as his heavenly hand hath enriched Your Highness with many singular and extra- ordinary graces, happiness and true felicity, to the honour of that great GOD, and the good of his Church, through Jesus Christ our Lord and only Saviour."